Australian aid agencies are calling for change to end the hunger crises in Africa at the same time that Australia has announced it is to pursue membership of the African Development Bank to support efforts to overcome poverty. One year since the devastating food crisis in East Africa became a global news story, leading Australian aid agencies Save the Children and World Vision are calling for a fresh approach to tackle hunger in Africa. In a new report, the aid agencies are calling for solutions that address the root causes of hunger and ensure families have access to the proper food, income and health so that the next time drought hits, catastrophe can be averted. “The Australian Government and the Australian people have shown they care about eradicating hunger, they want to help put a stop to these crises. What we need is a commitment to revamping the way we tackle hunger in Africa, a shift away from simply responding to emergencies towards preventing them in the first place,” said Save the Children Humanitarian Policy and Advocacy Advisor Rebecca Barber. The report, “Ending the Everyday Emergency,” identifies families’ lack of resilience, and not drought or food shortage, as the overarching reason for the crisis that today has affected over 18 million people in West Africa – a figure equivalent to 80 per cent of the population of Australia. “This is a region where children are chronically malnourished because of successive crises. But with the right long-term solutions, we can prevent this from happening again and help the most vulnerable families cope better when times are tough,” said World Vision Head of Humanitarian and Emergency Affairs Anthea Spinks. 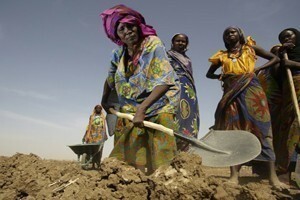 The latest food emergency is the fourth time this century that families in West Africa have been threatened by hunger. Australia committed $128 million to the hunger crisis in East Africa, and has to date contributed $30 million to West Africa. The UN estimates that for every US$1 invested in preparing for a disaster, US$7 spent on emergency relief could be saved. The Federal Government has announced that Australia will pursue membership of the African Development Bank and African Development Fund to support Australia’s efforts to overcome poverty and achieve the Millennium Development Goals in Africa. The African Development Bank promotes sustainable economic growth to reduce poverty in the African region. The Bank has 77 member countries, comprising 53 African and 24 non-African countries. Australia is the only developed G20 country not currently a member of the Bank. Deputy Prime Minister and Treasurer Wayne Swan said the Bank is already a valued partner in Australia’s increasing aid program in Africa and formal membership would demonstrate Australia’s intent to remain a long?term partner in Africa’s development. “It is in Australia’s national interest to support an organisation whose mandate is to spur sustainable economic growth and poverty alleviation in Africa, which would in turn help lay the platform for a greater Africa-Australia trade and investment relationship,” Swan said. Through the Bank’s programs between 2008 and 2010, more than 8.5 million people received improved access to water and sanitation and 16.4 million people greater access to health services. AusAID is now seeking public views, through written submissions, to Australia becoming a member of the African Development Bank and Fund. Further details can be found on AusAID's website. Submissions will form part of a National Interest Analysis which will be considered by the Federal Parliament’s Joint Standing Committee on Treaties. The closing date for submissions is 14 August 2012.